Carnelian Bay sits on the shoreline of North Lake Tahoe. Real estate in Carnelian Bay ranges from mid 300s to multimillion dollar Lake Tahoe luxury homes. Distribution of primary homes vs. second homes is evenly spread. Carnelian Bay is said to have a population of 524 and even has its own post office. Even though it sits at elevation 6,325 feet it is said to have Hot-summer Mediterranean climate, so it is no surprise that summer months significantly interfere with the census (and my driving). For the winter months ski resorts of Alpine Meadows and Squaw Valley offer real estate owners a chance to cool down on the slopes. There are many beaches that service North Lake Tahoe real estate and several in Carnelian Bay proper. One of the nice things about North Lake Tahoe real estate beaches is that they remain sunny late into the afternoon. It is on one of those sunny Carnelian Bay beaches that I learned about its namesake, the Carnelians, the semi-precious stones after which Carnelian Bay is named, but only after many years of stepping on them. Carnelians are brownish-red minerals that are often used as semi-precious stones. The name is a mispronunciation of Cornelian. 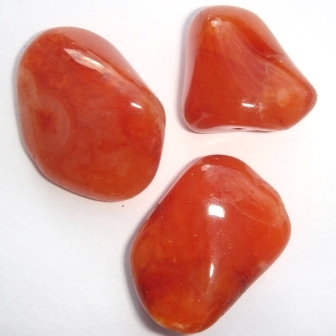 Carnelian is a variety of the silica mineral chalcedony colored by impurities of iron oxide, although, to a plain eye it looks like a pinch of sand got a beat down over the years, and decided to combine into a rock. To this day you can still find Carnelians on the Carnelian Bay beaches, and many Lake Tahoe real estate owners do fill their summer days scavenging for the little orange rocks. So, if you find yourself underwhelmed with Lake Tahoe beauty, look beneath your feet, and you may find some gems. Happy scavenging! Click to search the entire Lake Tahoe MLS or contact Olja Mihic, your Lake Tahoe Realtor , leader in Lake Tahoe Luxury Homes.